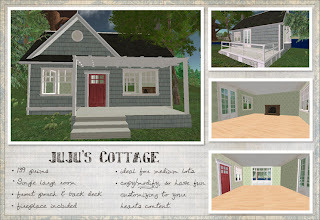 Tres Blah Update Blog: Cute blah houses for sell! I've been putting this off for so long, but finally *whew,* I have the houses, that some of you have been asking for, up for sell. They're only for sell at my Amicitia location and also will be, in a matter of minutes really, on SL Exchange. In Amicitia, you can see some examples of the cozy shanty and the Juju House. The cozy shanty (which may look different due to the owners own modifications) is located across the shopping center. The Juju house is located near the corner of the cross streets, not far from the shops. That's it for now! Later chicos and chicas. i love them too!!! i've enjoyed them for the last 2 months!!! i'm glad everyone else can now too!!! Yay! I'm so glad you're enjoying the houses, callie!! *cries happy tears* Jujubean is the bees knees! These are so awesome. second life cool places and other interesting issues about SL in Brazil. We are looking for sponsors for our website. What can we offer you? We can offer you several services, as banners and advertising, both in the website and at Second Life. If you have a fashion store or boutique, We can spread the word! You have a furniture or land store? Good! We can be your voice! Please contact us and check out our promotions! Banner 100x100 - or a space in our site. Use our site to advertise your party or events. We have more than 1000 Avatars in our mail list. We can spread the word! We may also do the photo session of the event. Just contact us, we can negotiate the price!